With a dearth of options for Arabic Cuisine in Bangalore, there are few places that serve the Mandi. When I heard about this new place in town, closer to home serving authentic Arabic Cuisine & most importantly the Mandi, I was curious to try them immediately with a bunch of foodies. 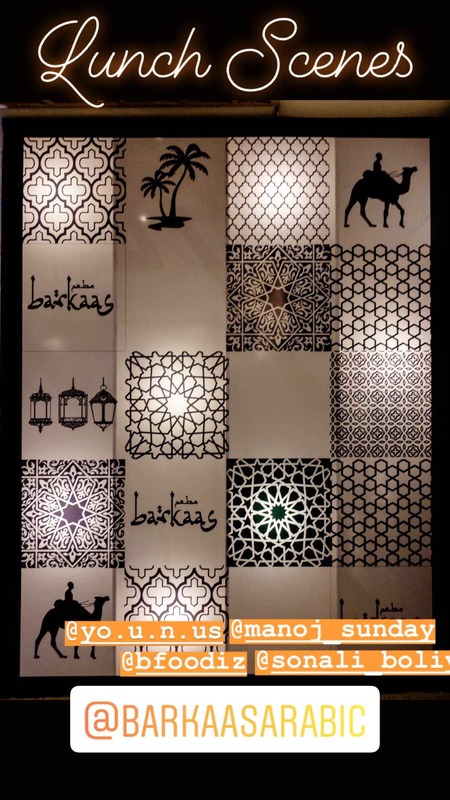 What I loved immediately about Barkaas is the ambience, which for a change is decked up to match the cuisine. Comfortable family style floor seating, the Moroccan lamps with hexagon elements that scream Arabia subtly. We started off with the house favourite & our favourite shawarma. A very plain looking shawarma. But what this beauty engulfs is something that you can never guess. One of the most delicious chicken shawarma in a quiet unassuming package of kuboos bread which was mindblowing. We did try the Mutton Shorba, which looked more like a nice meaty paaya soup, spicy & delicious. I requested for a portion of pita bread, dipped & ate the soup almost like a meal. Delicious Smoky Mutton Burra Kebab is something that you must try here. The meat was literally falling off the bone, such delicate flavours & smoky meat, absolutely delicious. The Arabian Style Fish was another delicious one, a whole basa fish fillet deep fried in a light crumb & some Arabian spices, was delicious. The delicious zafrani chicken kebab was stuffed to the core with minced lamb & chicken mix, absolutely fabulous idea & wonderfully executed & tasted divine. The Shish Tawook here was a very smoky beautifully cooked meat. Finally the star of the show, the massive Arabian mixed mandi comes with their signature meats from their Lebanese grill, Turkish grill, Arabian style mutton juicy, Arabian spiced fish, & chicken steak. While the meats were delicious, the Mandi rice itself was decent, and I was a little disappointed with the flavour in the rice. I would have expected a little more flavour. The dessert options were plenty, & we tried the Kunafa & Kaddu Ki Kheer which tasted delicious, with my few extra points going to the kheer, which was absolutely fabulous. This place is a must visit as much as for the food as much for the ambience, do visit with large groups.